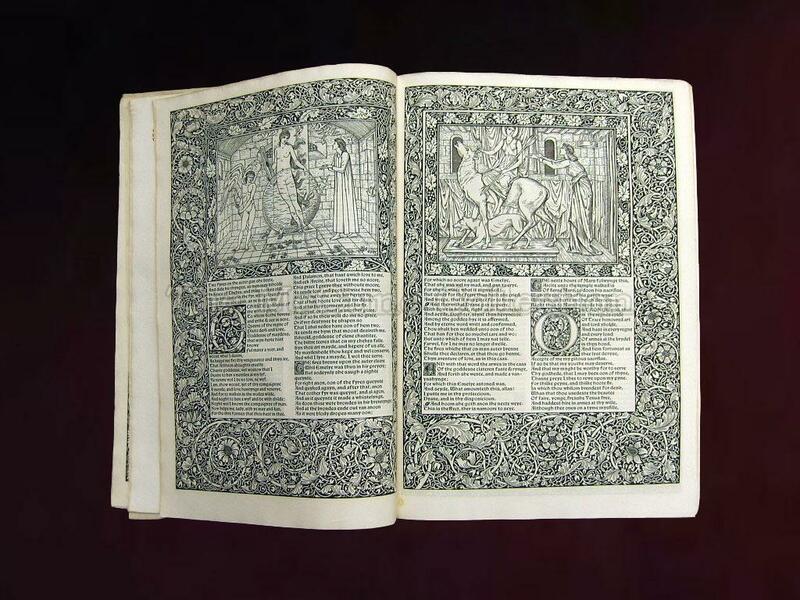 The Kelmscott Press’ The Works of Geoffrey Chaucer, Now Newly Imprinted (commonly referred to as the “Kelmscott Chaucer”) was published in 1896 by William Morris. 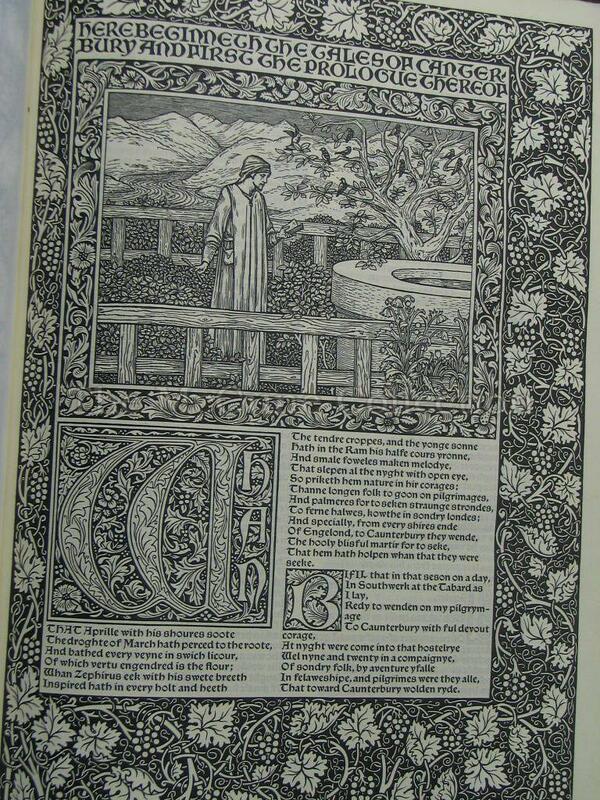 He lived at Kelmscott House in Hammersmith, England. 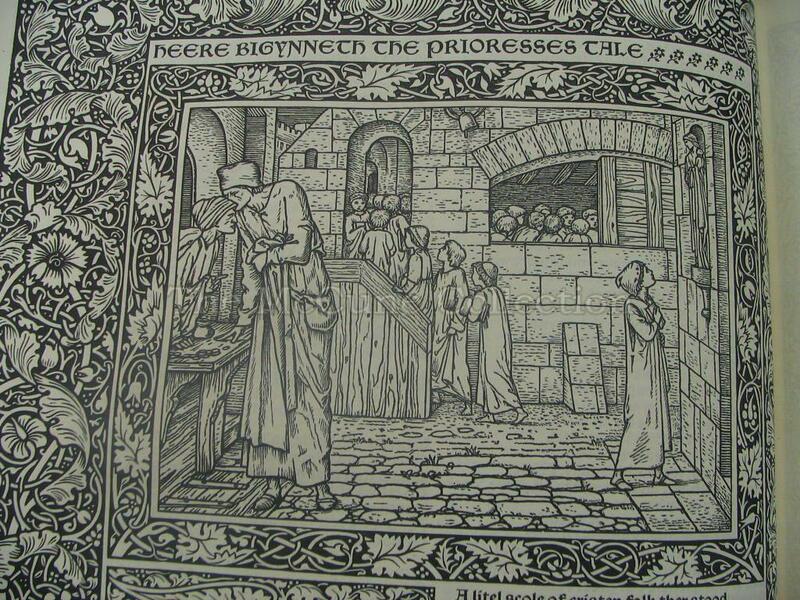 The press produced 425 copies in paper and 13 copies in vellum. 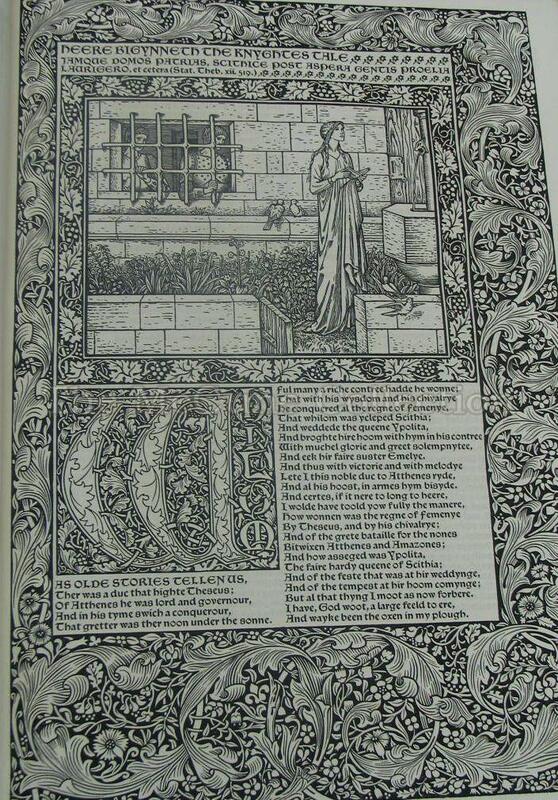 This was Morris’ final great effort since he died within a few months after its publication. 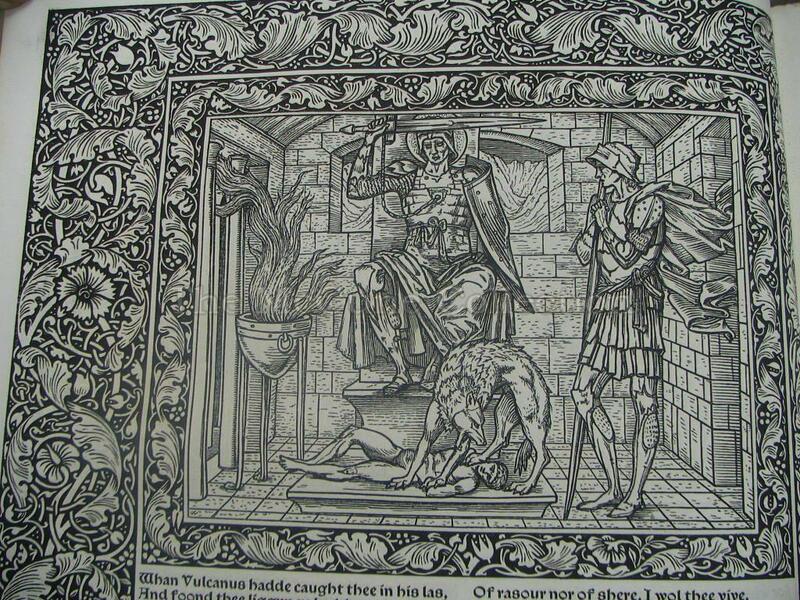 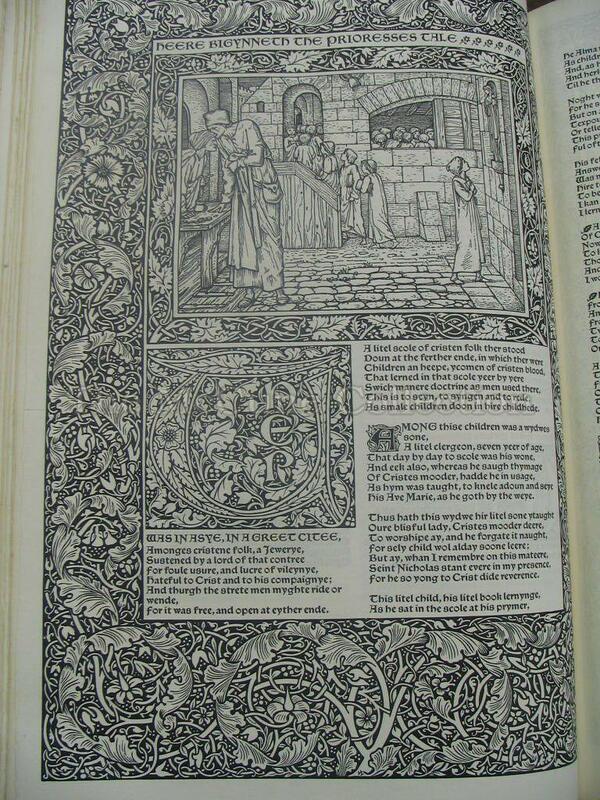 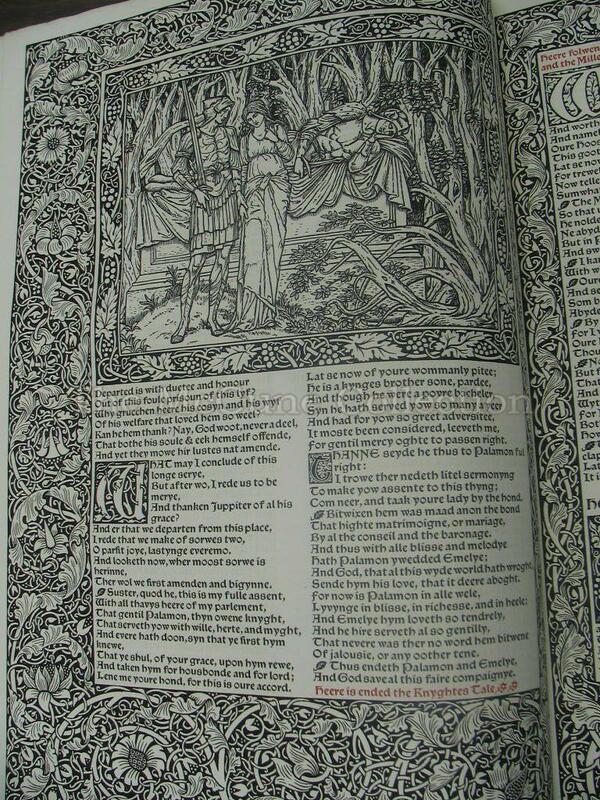 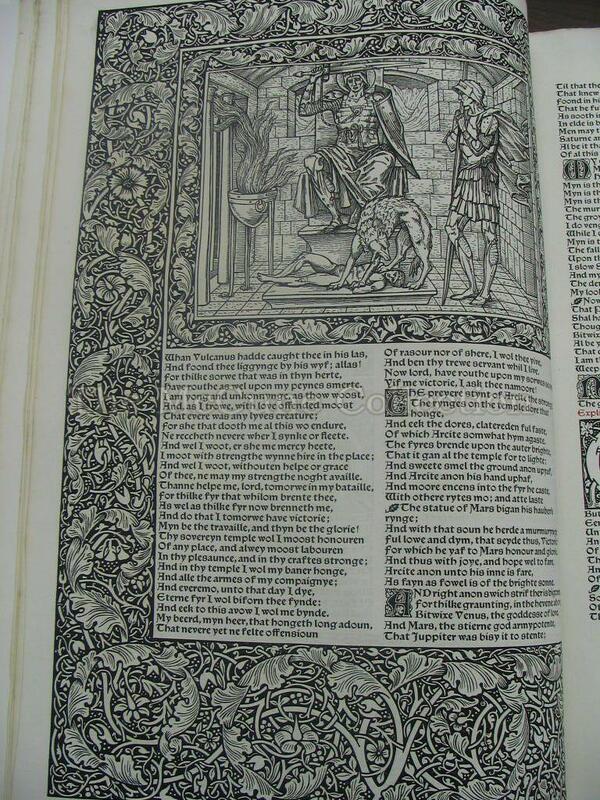 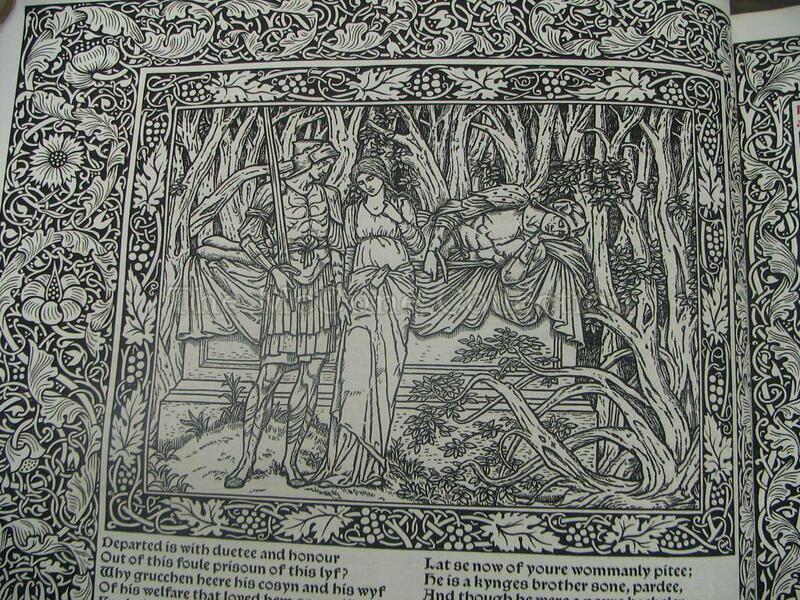 The Kelmscott Chaucer took four years to prepare. 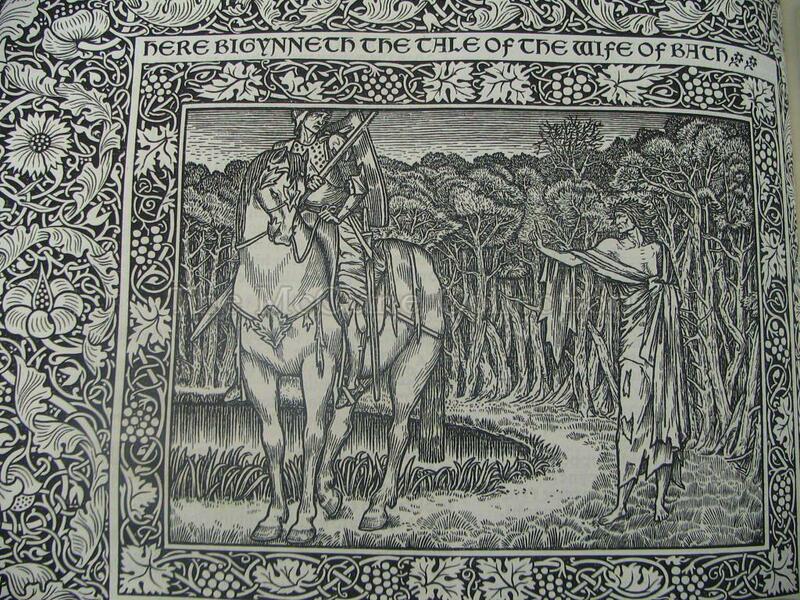 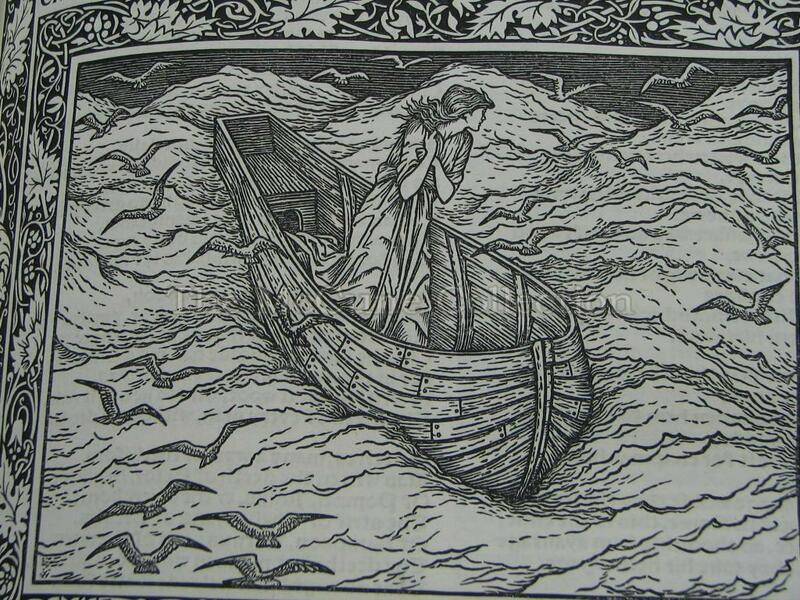 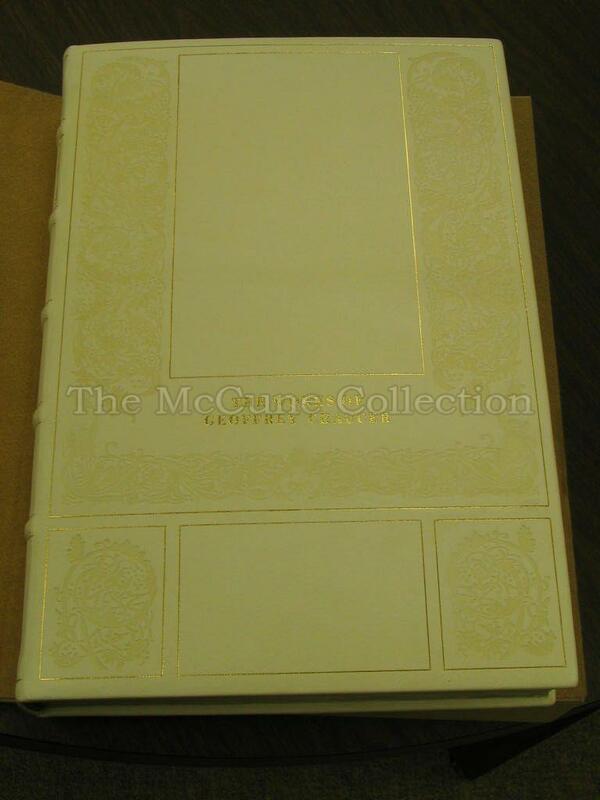 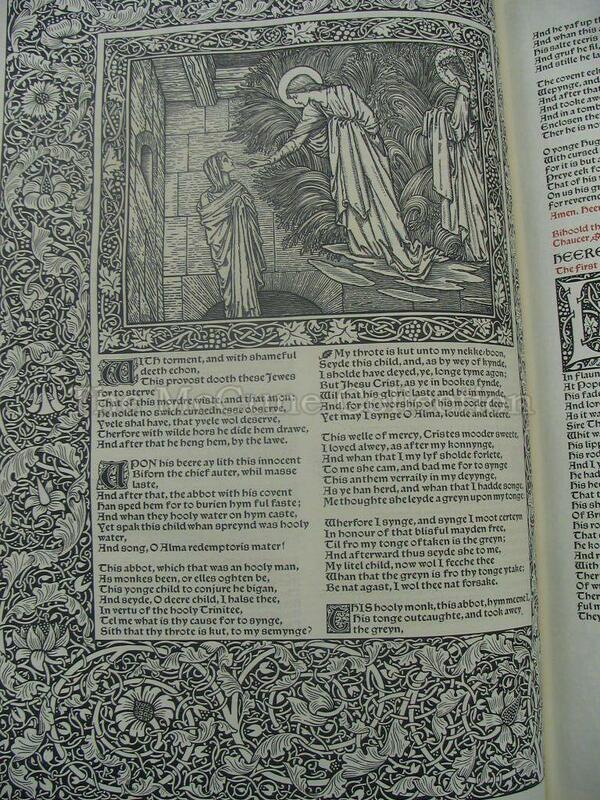 It contains 87 wood cut illustrations by Edward Burne-Jones. 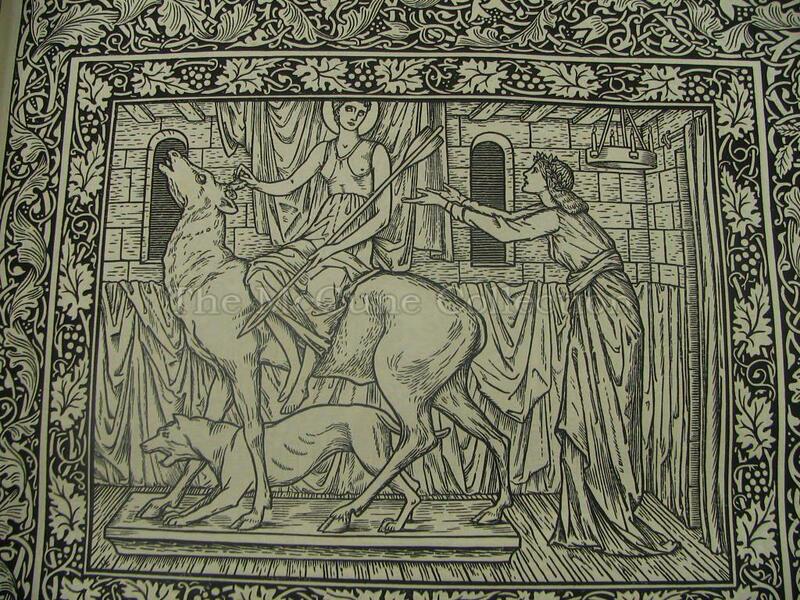 In addition, there are many large border decorations, frame decorations, large initial word decorations, and ornamental initial letter decorations designed by William Morris. 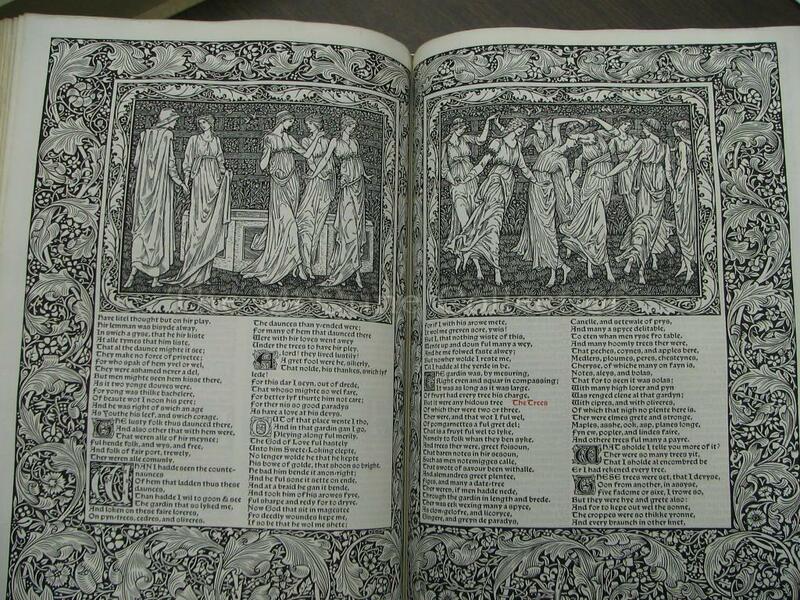 The book is printed in two columns of text with very elaborate illustrations and decorations throughout the book. 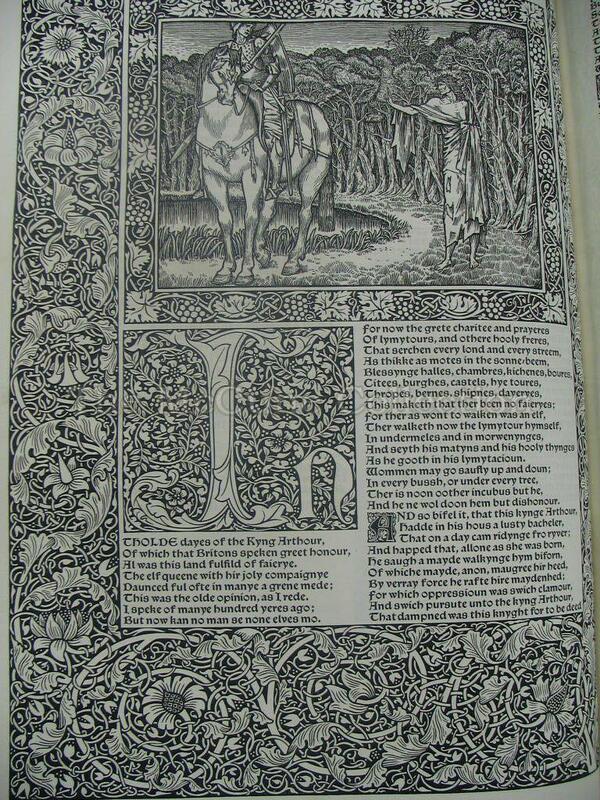 Because William Morris was an admirer of the Middle Ages, he attempted to imitate the calligraphy of that time. 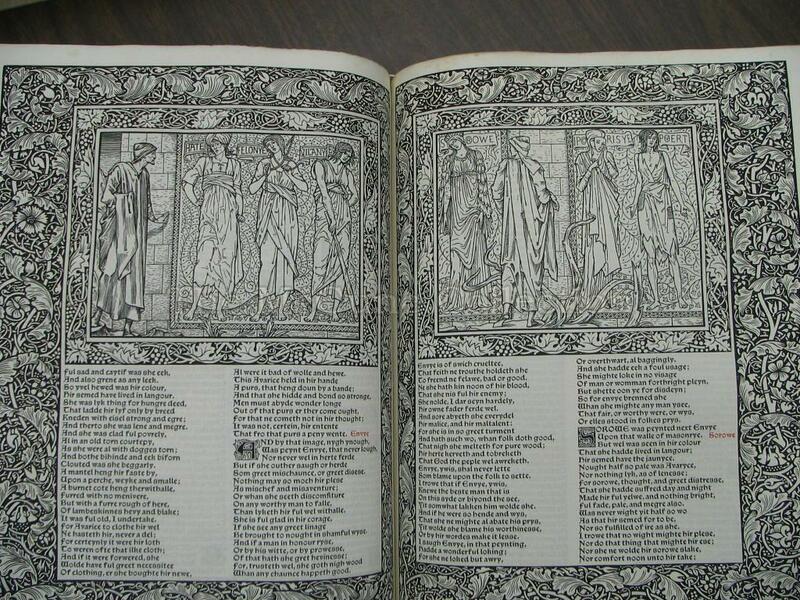 The majority of the text is set in a 12-point style called “Chaucer” type, while some of the headings are set in “Troy” type. 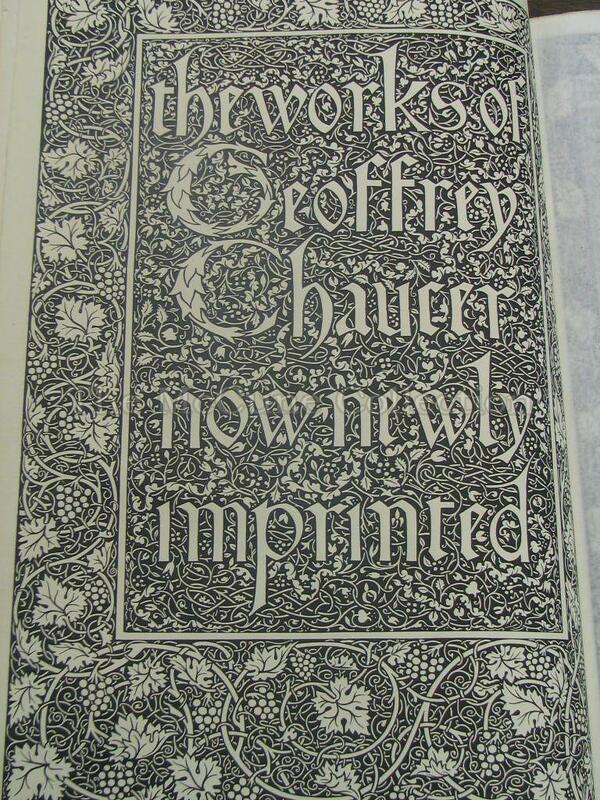 The type was handset on an 1891 Albion printing press on handmade paper. 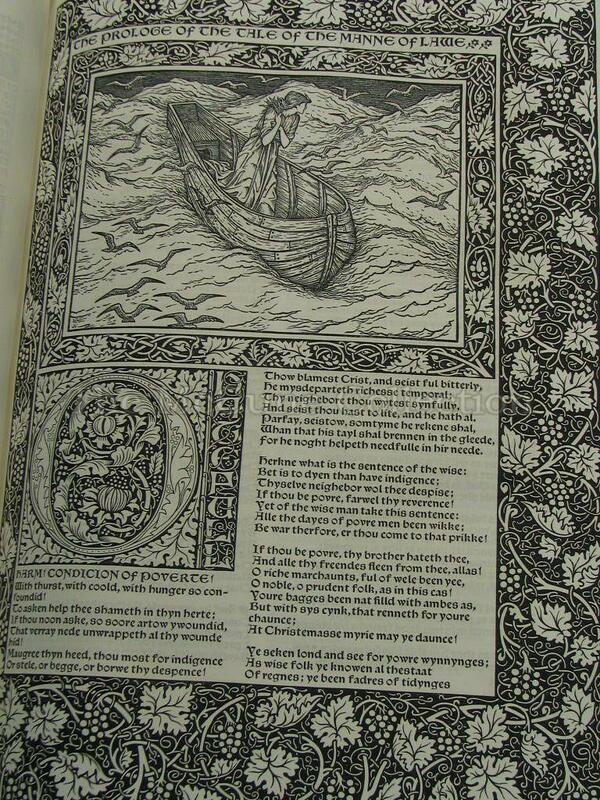 William Morris designed his type based on a work done by Nicolas Jensen in Venice in the 1470s. 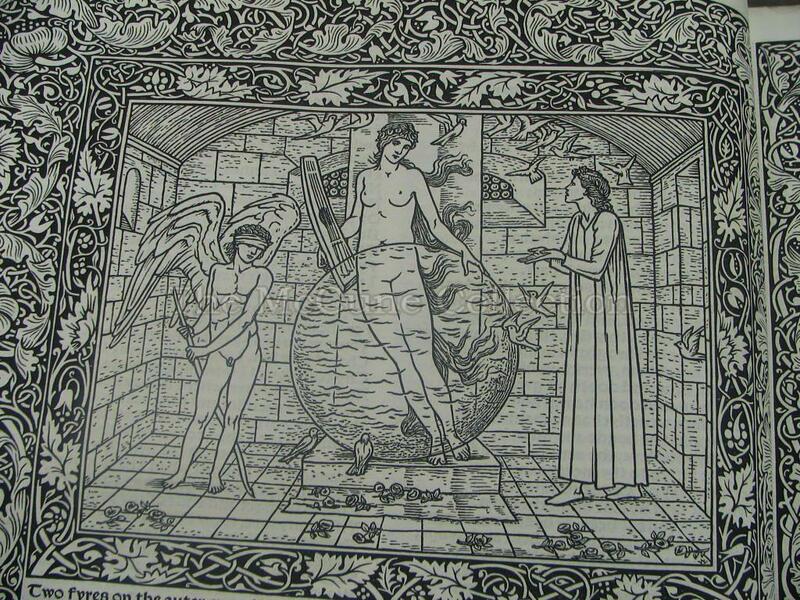 The ink was imported from Germany. 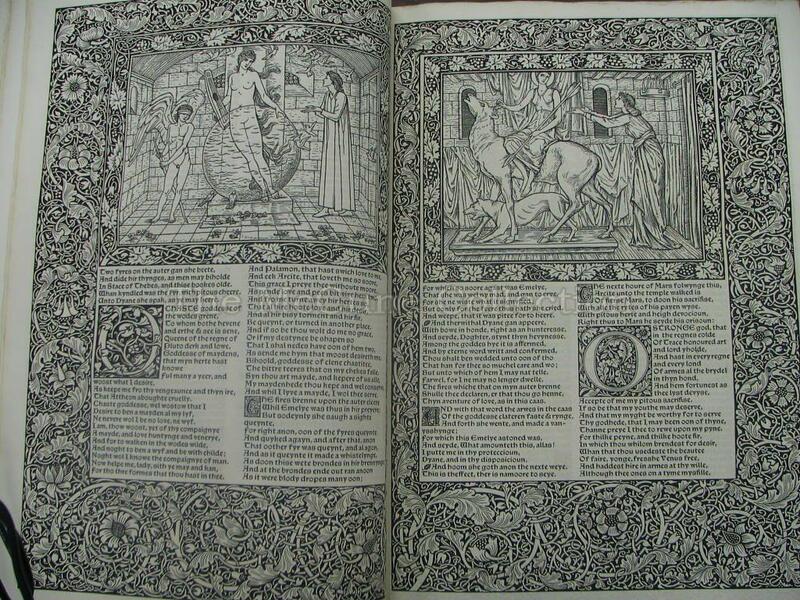 William Morris designed the book to show two facing pages as a single unit. 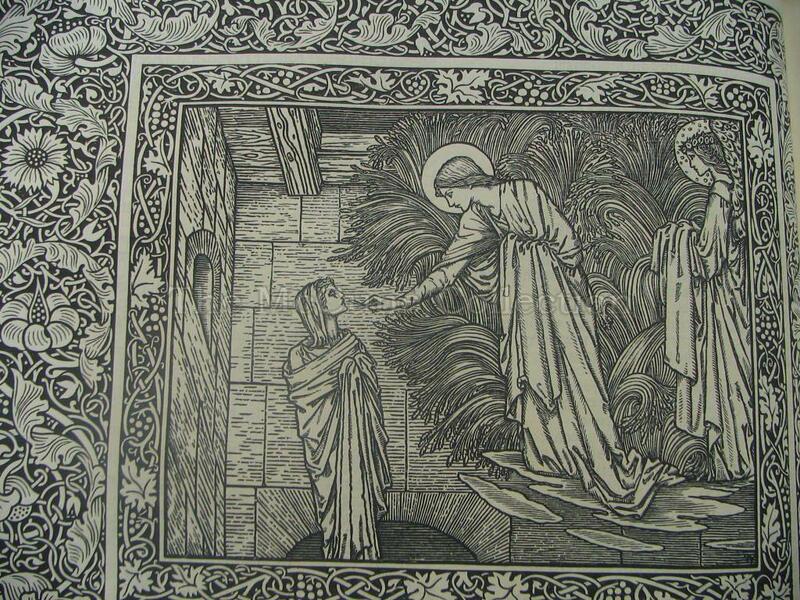 His goal was to make a artistic book that was unified in all aspects of craftsmanship – fine paper, fine ink, fine binding, and fine printing. 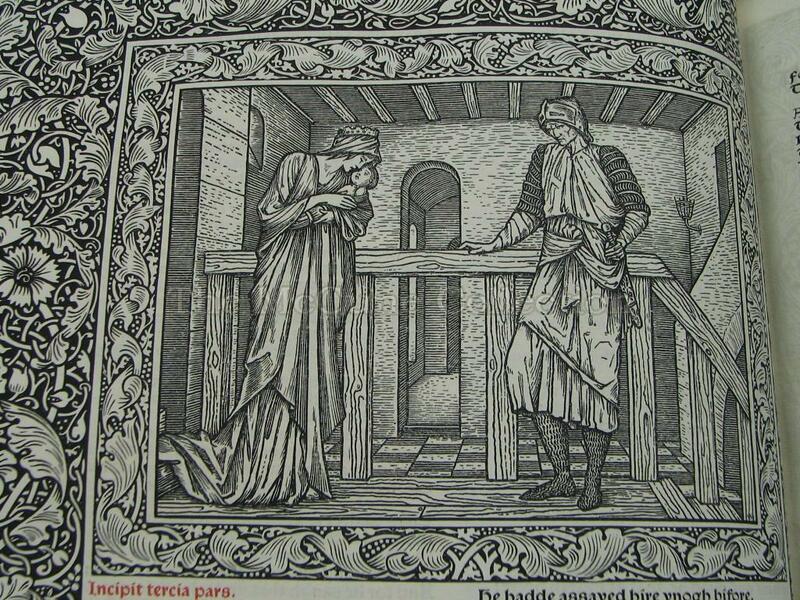 This was a reaction to the poor workmanship of most other printers of the period. 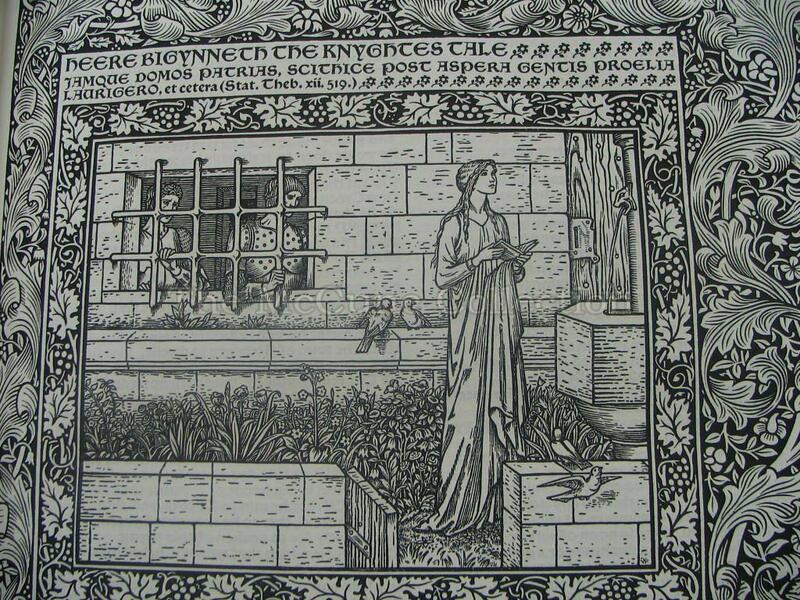 The high quality of his work was a major factor inspiring the rise of fine printing presses in the twentieth century. 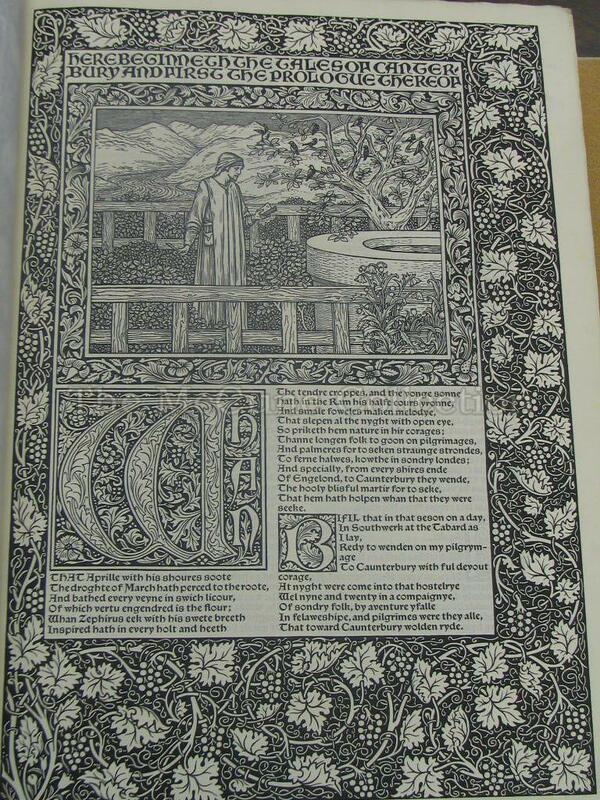 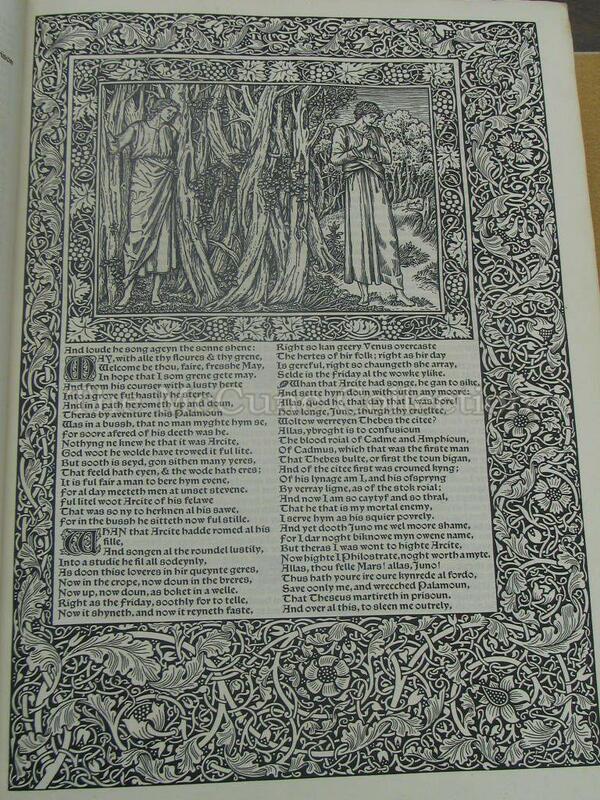 The Kelmscott Chaucer has been called one of the most beautiful books of the nineteenth century and of all times. 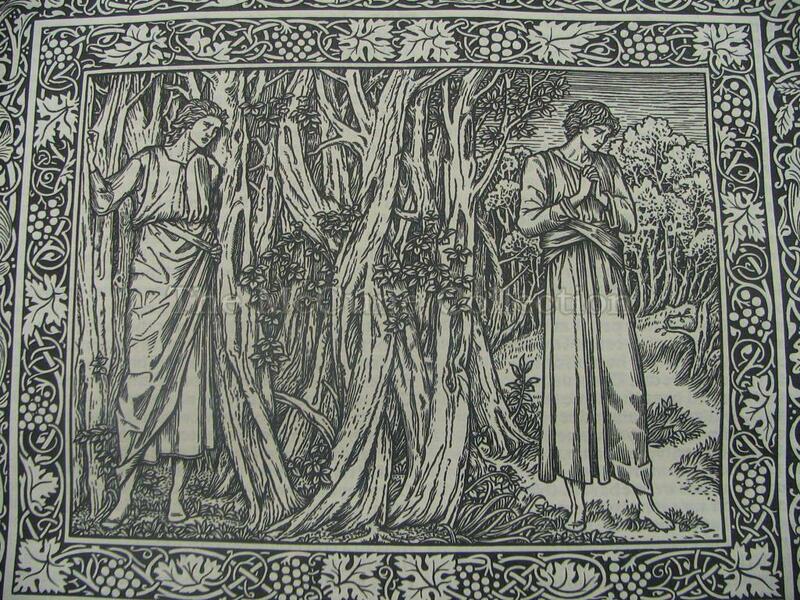 Burne-Jones referred to the work as a “pocket cathedral.” Even though the book was sold out before it was even published, it was not a financial success. 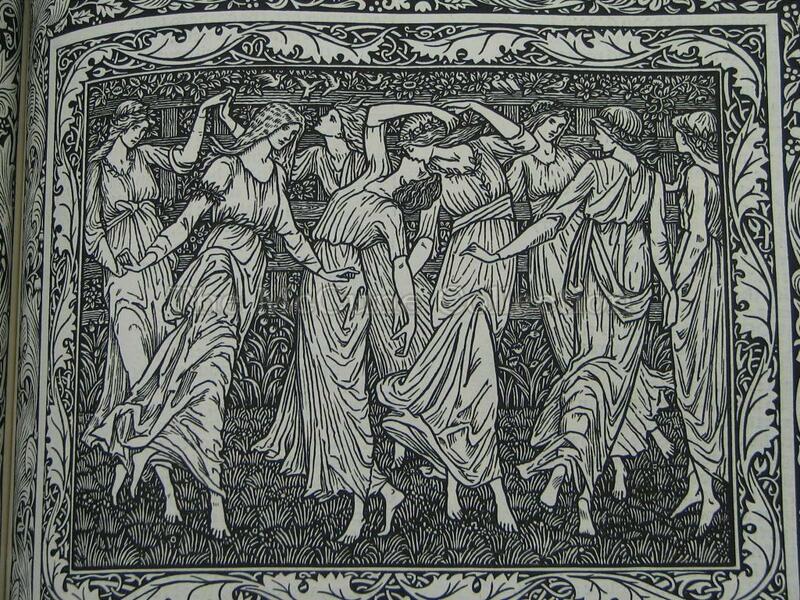 William Morris had to subsidize its production from the income of his other earlier works. 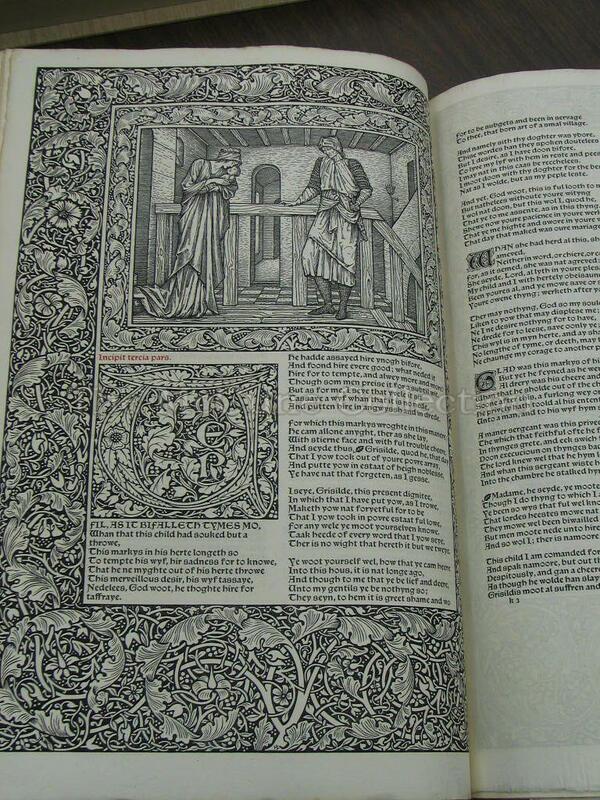 A complete online copy of the Kelmscott Chaucer can be found at the Bidwell Library, Southern Methodist University, Dallas, Texas at http://www.rarebookroom.org/Control/chkwks/index.html.